"A certain percentage and, furthermore, a small percentage of 'psychiatric patients' are really possessed. The majority, however, of psychiatric patients are not possessed nor are the manifestations of their psychiatric illnesses due to demonic influence." "And how can we tell that there is a possession, when it is such?" "The Church diagnoses possession from the position of the sufferer as regards the Sacred Sacraments: Divine Communion, Confession, etc. Or as regards the Gospel, the Precious Cross, the sacred relics or the holy icons and, in general, sacred things." 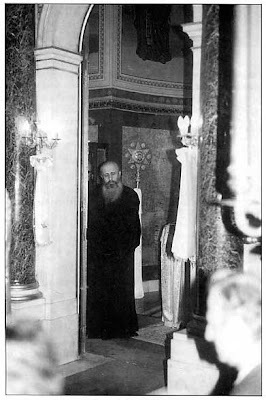 Father --- tells me that at Saint Gerasimos of Kefallonia they used to place the Holy Scripture or some icon on the back of a possessed person lying face-down - that is, without them seeing in order to exclude the possibility of suggestion - and then the possessed person would tremble, a thing which would not occur when they would place other types of books or objects on him." "Do we have any example of psychosis among the saints?" "Certainly. I will off hand mention to you Saint Olympia the Deaconess. After the exile of Holy Chrysostom, her Spiritual Father, she suffered depression and this Saint consoled her with his letters reminding her of the divine reward for those who are persecuted in the name of the Lord." "Do epileptics have a demon?" "Not all. In many of these, the brain simply is ailing and this has as a result the manifestation of seizures, deafness, etc. - manifestations similar to the ones of those possessed, as they appear in the Gospels." "Why did the Lord do so many miracles with the possessed?" "So that the superiority of the Lord's power over the demons would be made manifest and so that the people would believe in Him. These miracles seem a lot in number, because it is likely that God allowed the devil to bother people more at that time, without the possibility being excluded that the number of the possessed people might have been the same as the number of those of all ages." From Counsels For Life: From the Life and Teachings of Father Epiphanios Theodoropoulos, pp. 204-205.